Based on the 997 type 911 GT3 RS sports car, the 2012 911 GT3 RSR will compete at the Le Mans 24 Hours, the FIA World Endurance Championship, in the Le Mans Series, the American Le Mans Series and the International GT Open (just to name a few). 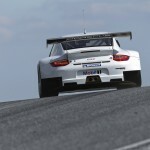 Heading into the 2012 season, the GT3 RSR comes with extensive modifications from last year's version. Most noticeable are the changes to the body. The 2012 version flares out almost 48 milimeters (2 inches) wider than last year. Paddle shifters operate the sequential six-speed gearbox that put 460 hp (even with the mandatory air-restrictor affixed) to the 310 millimeter (12.2 inches) wide rear wheels and front wheels that have increased by 30 millimeters (1.2 inches). Lastly, there is new ducting for the intake of air including openings on the rear side sections (similar to the Turbo variants) that replace the air scoop on the engine hood. 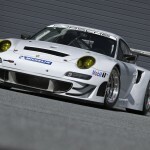 The new Porsche 911 GT3 RSR will be delivered to customer teams starting in January of 2012. If you want one for your garage, the selling prices is about 500,000 Euros (we're still trying to get in touch with Porsche Motorsports North America to get the US price). 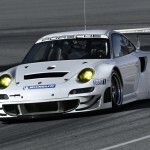 UPDATE: The 2012 Porsche 911 GT3 RSR sells for $533,000 from Porsche Cars North America, Inc. plus features listed below. What will Porsche premier at the LA Auto Show? Can’t Get Enough Rennsport Goodness? Now You can Watch it on TV Too!! The comparable Ferrari and BMW prices might put the RSR pricetag in better perspective?? It’s a beautiful and probably more aerodynamic alteration, but I wonder how long those front fascias will last at Sebring? What’s a “Bosch Memory Darab License”? We assume it is some type of data logger, but we put in a question to PMNA to see what they say. We’ll let you know.